“All eyes on the water!” Captain Tom calls over the loudspeaker. We obey, scanning the water for signs of a Humpback Whale. This is not my first time on my favorite boat, the American Princess, with one of my favorite nature groups —the nice folks at Gotham Whale. But I’ve never been out this late in whale-watching season. This November cruise was cold and windy — complete opposite from my journey back in July during a heat advisory! Back on that hot and sticky day, the breeze was welcome. We cruised past Brighton Beach, Coney Island, and Breezy Point, watching the sunbathers on hot sand. I love a beach afternoon, but it looked crowded and a bit unpleasant, so I was happy to be on board. That summer had already been remarkable for whale and dolphin sightings . As we motored past Breezy Point, Captain Tom explained that plenty of our quarry had been spotted the day before, thus we were an excited bunch as we layered up in sunscreen. As with any nature-watching excursion, flexibility is key. So it was too bad that the whales decided to elude us, but Bottle-nose Dolphins were out in droves! Final estimates were around 70. Do you see the baby dolphin? Now, four months later, sunscreen has been replaced by 3 layers of clothing, and cold water for hot chocolate. No heat advisory today! But the sun was bright and our spirits the same as our dear ship slipped out from her Riis Landing dock, cruised past the Rockaways and into the Lower Bay en route to the New Jersey coast with winter waterfowl tagging along. 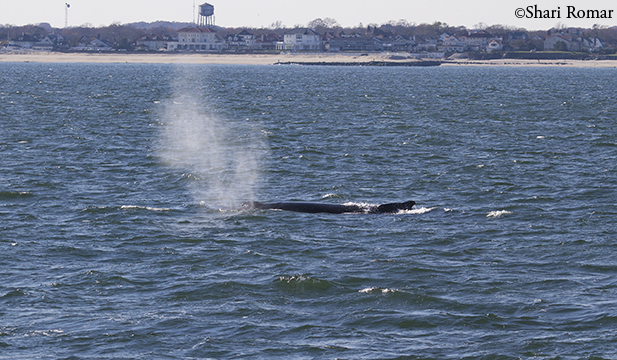 We were nearby Asbury Park when Captain Tom called our attention to the water. Within minutes, blow was spotted. This is the little puff of water vapor coming from a whale’s blow hole when exhaling. Essentially it looks like a puff of smoke and while easy to miss, once spotted, the next job is to start looking for more whale activity. And what activity it was! 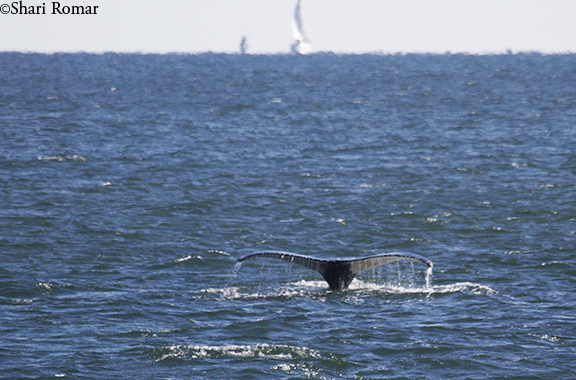 This sweet whale gave us quite a nice show….. Interesting view of the blow hole. 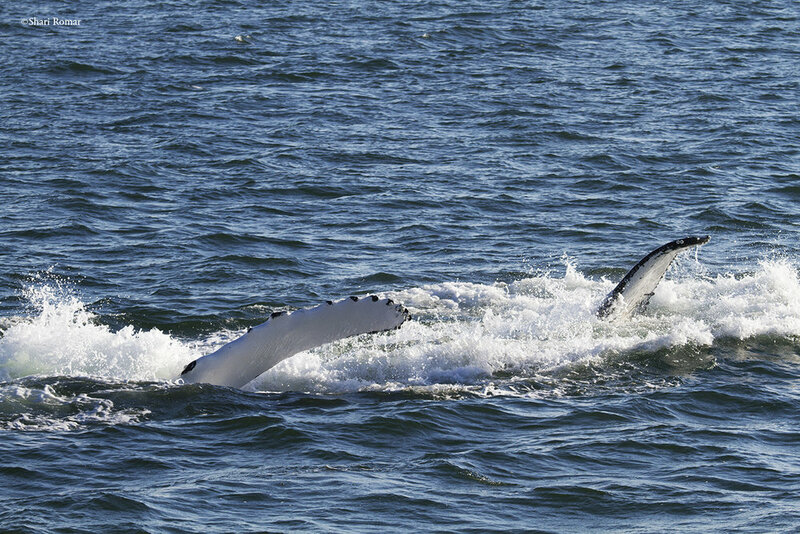 This feeding process is called lunge feeding, and can give observers some great views of whale behavior, not to mention photos. 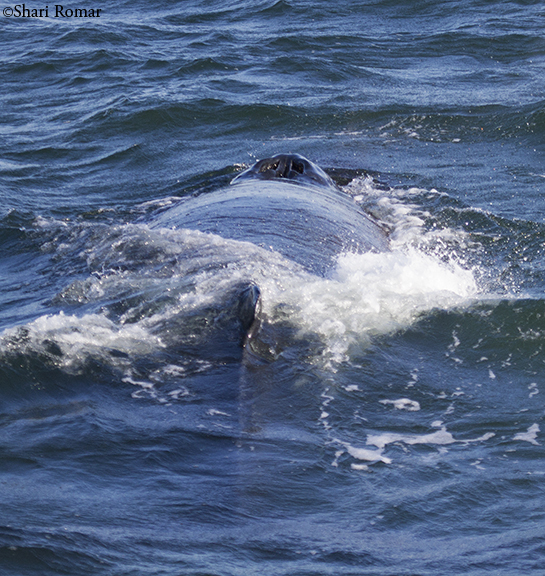 Besides lunge feedings and sightings of fin and tail, a wonderful sight is a breach, essentially when the whale leaps from the water’s surface. On that cold day our whale did a small breach. And I missed the photo by seconds.